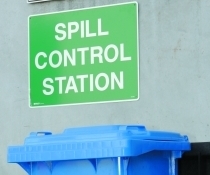 The sign helps saves time when a spill incident occurs and encourages staff to return the kit to its right position. It is reflective and highly visible. • Wherever spill kits are located on a site. • Can be installed with screws, rivets or glue as appropriate.